I know, I know, it can’t be both new and improved! Well, the German translation is new. And there’s a new border option. And those are pretty big improvements to my much-loved Elfbaby pattern. 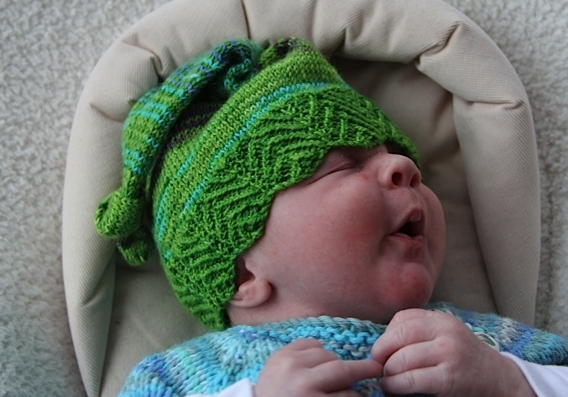 Elfbaby is a super versatile pattern, with sizes from newborn to large adult, and three different border options – so you can choose a different effect to suit your yarn and intended hat wearer. I’m thrilled with how many people really make the most of this array of choices; one knitter made EIGHT hats, for every member of her large family! The only problem was that one of the border options, a pretty lace pattern, turned out not to be really elastic enough for a hat brim. It worked okay, but it didn’t perform as well as the other choices. So I’ve replaced it with a lace version of Pixi, the most popular border (pictured above). Elfbaby is available in my GAL sale bundle, meaning you’ll get 25% off till 29 November if you use the code giftalong2018. Don’t forget to check out the rest of the Giftalong patterns, there are literally thousands to tempt you!